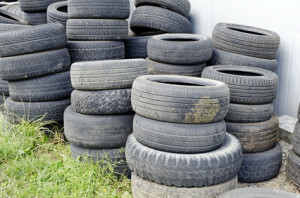 According to the Environmental Protection Agency (EPA), about 290 million scrap tires are generated on a yearly basis. Out of this amount, 233 million are sent to market, 130 million are used for fuel, 56 million are used in civil engineering projects and 28 million are used for ground rubber products. Tires, of course, aren’t the only rubber products in use. Rubber is also used for everything from gloves to gaskets. O-ring manufacturer Apple Rubber notes that rubber compounds can be made of 3-15 ingredients. All of the possible combinations of these ingredients can add up to thousands of possibilities for the specific composition of a rubber compound. Many of these ingredients are meant to prevent the rubber from breaking down. Antioxidants, antiozonants and fillers protect the rubber from heat, oxidation, cold and other environmental stresses. While this breakdown resistance makes rubber compounds great components for use in cars and other durable items, it also makes rubber hard to get rid of when the time comes. Fortunately, there are many ways to recycle the substance into new materials. Tires, in particular, are some of the most commonly recycled rubber-based items. This is because they are strong enough for other uses even when they can no longer hold air. They also contain enough energy to be converted into fuels or fuel oils. With the proper treatment, tires can be broken down into oil, steel and carbon black. The oil can be used much like other petroleum products to provide heat, while the steel can be recycled into many other things. Thanks to the development of special machines for recycling tires, reusing this waste rubber is economically viable. This is one of the reasons so many tires are used for fuel. Old tires are also used to make durable materials like flooring. One company, U.S. Rubber Recycling, has built its entire business on reusing tires and other rubber materials. They say that their flagship product, SureStep Tire Tile, was chosen by Wal-Mart to serve as a flooring material for the chain’s entryways. Later, as consumers shifted to using steel-belted radial tires, the company adapted by making their flooring products from crumb rubber. Now, they produce a wide range of tiles made from this recycled material. This is just one of the uses for recycled tires. They’re also used as components in asphalt paving, ground up and used as mulch, reformed into swings and other child’s play items, used to create garden boots and more. One of the surprising applications for used rubber is a shock-absorbent playground surface. It turns out that the rubber chips are strong enough to prevent the deterioration of the area, while being springy enough to keep kids from getting hurt when they take a tumble on the playground. All of these uses mean that old tires aren’t the environmental hazard they used to be. With today’s technology, letting tires sit in a pile is more than environmentally detrimental, it’s a waste of money. Needless to say, this means that companies are less willing to let this rubber sit around. As a consumer, you can do your part to encourage recycling of tires and other rubber items by buying things that are made from recycled rubber components. These products are usually very durable and, thanks to advancements in modern manufacturing methods, they’re nice-looking. To encourage tire recycling even more, push your local municipality to use asphalt and other surfacing materials made with rubber from recycled sources. Thanks a lot for the above message. It seems i can make something from this.